Stormwater runoff accumulation on impervious surfaces like buildings, parking lots and roads prevents rain from infiltrating back into the ground. This causes flooding, interferes with the recharging of groundwater reserves used for drinking water, and reduces the shallow groundwater flow systems that maintain the base flow conditions between rainfall events in lakes and rivers. The US Geological Survey reports that half of the drinking water in America comes from groundwater reserves, while the other half comes from lakes and rivers. When properly managed, stormwater runoff drains quickly and efficiently, preventing flooding and replenishing drinking water sources. 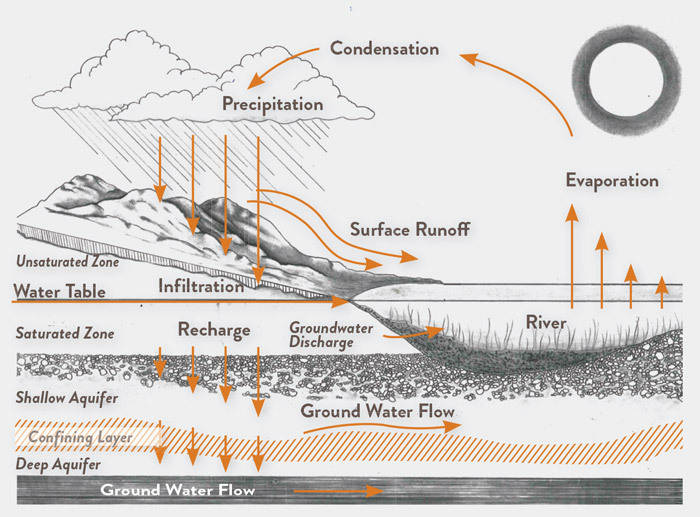 With PARTIAL INFILTRATION systems, which are used on Type C and some D soils, the amount of excess rain that accumulates in the base/subbase is regulated by the elevation of the outlet control for the underdrain, which is set to only store as much water as can drain in 1 to 2 days post rainfall event. 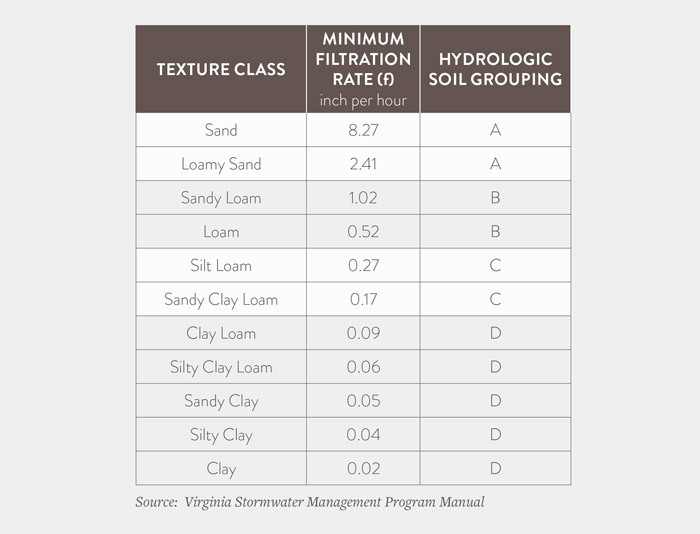 It is a common misconception that a high soil infiltration rate is required for an infiltration system to work. The majority of 95th percentile design storms in the US range from one to two inches total precipitation. Even at infiltration rates as low as 0.05"/hour, it would only take 40 hours for full 2" of rain to drain out of the aggregate base/subase storage zone. 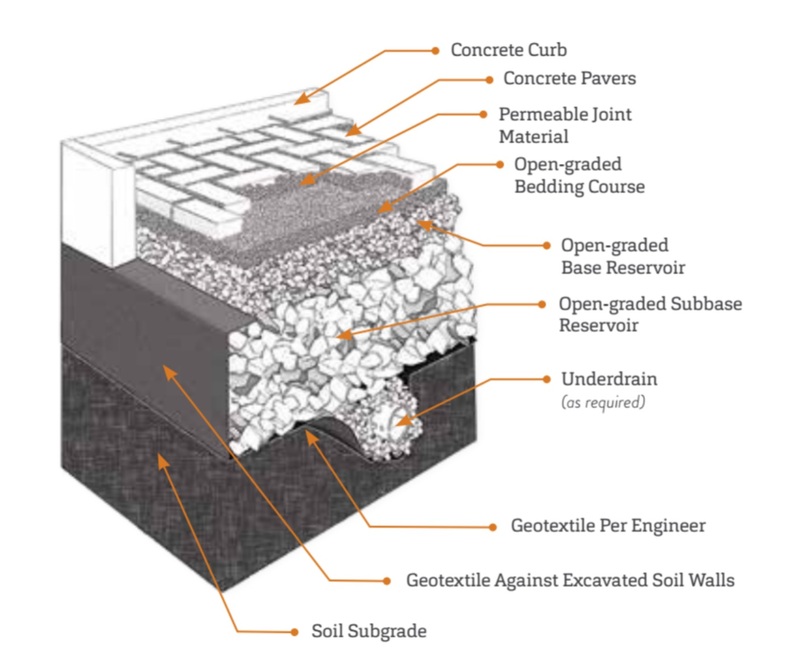 Permeable Interlocking Concrete Pavements (PICP) are fundamentally large scale infiltration galleries with a drivable surface course over top. The open graded base and subbase aggregates have approximately 32% and 40% open space respectively, providing for temporary water storage. Being the same aggregates used for railway tracks, they are more than capable of supporting vehicular loads. With FULL INFILTRATION systems, which are used on soils with high infiltration rates (Type A and B soils), it is expected that any precipitation that falls will drain almost as quickly as it is introduced; any excess rain can accumulate in the subbase for the short term.